A Plano, TX-based consultant, Conventions, Sports, and Leisure International (CSL International) has concluded that there's a healthy market for the planned Brooklyn Arena, given the large local population, the base of potential sponsors and advertisers, and the enthusiasm of promoters. Notably, it even suggests that the arena, though downsized to the point it couldn't accommodate professional hockey, could be retrofitted if necessary to house another pro team. It also suggests that there's un-met demand in Brooklyn and nearby boroughs/counties for events that could be held at the arena. 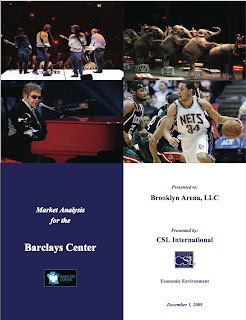 The 180 page Market Analysis, conducted at the behest of arena sponsor Brooklyn Arena LLC (controlled by Forest City Ratner), was included as part of the the Barclays Center Arena Preliminary Official Statement prepared by Goldman Sachs. CSL acknowledges that "information provided to us by others was not audited or verified, and was assumed to be correct." It also notes that its estimates reflect an improved long-term economic outlook, not a prolonged economic downturn. The Nets currently play in one of the oldest facilities hosting a National Basketball Association franchise. The IZOD Center, the Nets’ current home, offers only 28 private suites and no club seats, compared to an NBA average of 94 private suites and approximately 2,100 club seats. The lack of premium seating limits the ability of the Nets to generate revenues. The Brooklyn area is part of the most densely populated metropolitan region in the nation with approximately 2.51 million residents. With easy access to the tri-state metropolitan marketplace (New York, New Jersey, Connecticut) and the convergence of commercial and retail business, educational institutions and residential neighborhoods, a downtown Brooklyn site is ideal for a new state-of-the-art arena. The New York metropolitan area has a high number of professional sports venues and franchises that will present competition to the Barclays Center and the Nets. However, the market has the fourth highest ratio of population per professional sports franchise among the markets analyzed and the Nets are already an existing franchise in the area. The corporate markets in both Manhattan and Brooklyn/Queens were surveyed and indicated a high level of support for the Barclays Center in Brooklyn. Based on interviews conducted in late 2008 and April 2009 with local and national promoters, the development of a new arena will provide the marketplace with a state of the art facility that will better serve concert and family show promoters. It is expected that the new arena will likely generate incremental events that are not currently being accommodated in the marketplace due to a lack of availability and amenities. It is also likely that the arena will attract a number of events that are currently held at the other area venues. If the IZOD Center ceases to operate after the opening of the Barclays Center, the new arena could accommodate a significant number of those events no longer held at the IZOD Center. Moderate and aggressive event estimates have been developed for two different arena scenarios. One scenario assumes that the IZOD Center remains open and is competitive with the new arena, while the other scenario assumes the IZOD Center ceases operations after the Barclays Center opens. It has been estimated that between 184 and 214 events could be held under the scenario with the IZOD Center continuing operation and 204 and 234 assuming the IZOD Center closes. The naming rights deal secured for the Barclays Center is considerably larger than any other facility hosting an NBA team. At $200.0 million, the naming rights agreement secured at Barclays Center is greater than the largest naming rights deal secured by an NBA-only facility and comparable to the largest naming rights agreements secured by other NBA/NHL facilities. At a term of 20 years, the Barclays Center naming rights agreement will provide annual revenue to the facility of $10.0 million. Although the naming rights agreement secured at Barclays Center is larger than the amount of the next largest naming rights deal secured by an NBA-only facility, when the amount is analyzed on a per capita value basis, it is below the average of the NBA-only facility naming rights deals... The per capita naming rights value secured at Barclays Center is $0.53, which would rank eleventh among NBA-only facilities and is approximately half of that average for NBA-only facilities..
Pre-selling of naming rights and sponsorships has gotten off to a robust start, adding further credence to financial and operating estimates and projections. To date, the Barclays Center has executed a record naming rights deal with Barclays PLC, as well as contracts representing an additional $10.5 million in annual sponsorship revenues including $1.8 million in the first quarter of 2009. These transactions suggest strong support in the marketplace for the Barclays Center’s ultimate success. The amount of contracted sponsorship revenue is unique among comparable facilities – in fact, the Barclays Center’s revenues are akin to a two-team facility – and gives the arena a strong position while selling remaining sponsorship opportunities. Some of the underlying factors that contributed to the magnitude of the naming rights agreement secured at Barclays Center include the size of the of the New York media market, the number of impressions sports facilities in New York generate annually and the extent to which the surrounding area is a retail and residential destination which serves millions of people annually. The New York Islanders could potentially become a tenant of the proposed arena as well, moving from their current home of Nassau Veterans Memorial Coliseum...Current design plans would see the Barclays Center constructed as a facility that is to be used primarily for basketball. If built as planned, the arena would need to be retrofitted to accommodate the ice-making abilities the NHL requires for its franchises. For purposes of this analysis, it has not been assumed that the New York Islanders would relocate to the Barclays Center. When considering only the ten largest U.S. markets, the average ratio of people per seat falls to 146.4, resulting in an unmet demand of 56,313 seats when applied to the New York market population. Even with the large number of new or renovated sports venues and inclusive of the Barclays Center, the NYC CBSA has higher population per seat and higher population per event than other major CBSAs. This data suggests there is demand for additional events in the marketplace.